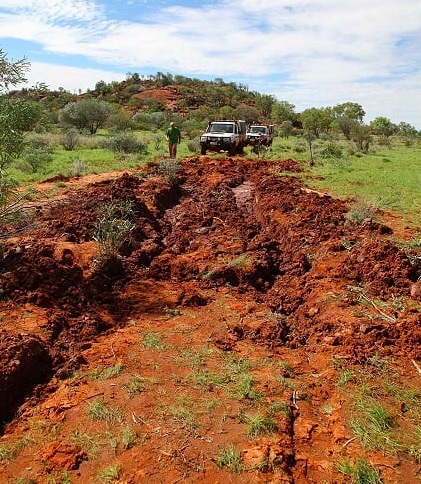 Sir – The rains in Central Australia over the Christmas and New Year periods were amazing but played havoc with the roads and made travelling difficult. On New Year’s eve a friend and I went on a short afternoon drive from Yuelamu with Jack Cook, an Aboriginal man who has lived there all is life. He assured Harold and me that the road was perfectly driveable even after the amount of rain we had. I should have known better as I have been a regular visitor to Yuelamu for 20 years. A moment’s lapse in concentration, a tyre width off the centre of the road and into the mud we sank. I opened the door, stepped out and nearly lost my boots in the oozing mud. There was a firm crust with liquid mud underneath and shovelling only made the situation worse. We walked back to the community as it started to rain. It rained all night. 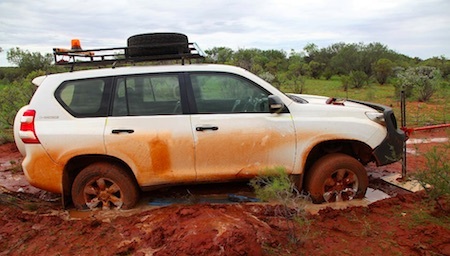 After ridding ourselves of the mud that caked us, we called the Yuendumu police to see if they had a vehicle with a winch. Sgt Anne Jolley said she would assist us following afternoon provided she could get to us. We equipped ourselves with timber to put under the tyres, large boards to prevent the jack sinking, and an additional shovel and headed back the following afternoon. The overnight rain had made things much worse. It was hard to dig the soft ooze – it weighed a ton on the shovel. Lifting the laden shovel caused you to sink into the mud. It turned out to be a lot worse than it looks. We persevered. We would jack the car up, dig out underneath to free the diff and chassis and then place timber under the four wheels. The car would be inched back a foot or so and the process repeated. We walked back to where we had parked the other car to get some more timber and the police turned up at almost the same time. We explained to Sgt Jolley and Constable James Rose (pictured at top) where the vehicle was and advised that just a few inches off the road was very soft despite the firm crust on top. Constable Rose attempted to get as close as possible to our vehicle but approached a bit too close and ended up getting bogged himself. The four of us continued to dig, winch and dig again. Constable Rose drove and as we pushed Sgt Jolley unfortunately was behind the rear wheel and she ended up covered in mud! We all laughed. Throughout the day that is one thing that was remarkable, the spirit of both officers and their willingness to help was pervasive. They never gave up and never stopped trying. We made slow progress, but ended up losing to the fading daylight. We called it day for safety reasons and retreated for the evening. We re-convened the following morning in sunshine! This time there were five of us, as Sgt Jolley’s son Tim had volunteered to help us dig. The enthusiasm had not waned. The mother of all bogs. Both officers seemed to be inspired by the challenge. Sgt Jolley may be small in stature but she has incredible energy and drive. She was sitting in the mud shovelling from under the vehicle, providing guidance to us all and ensuring safety during the recovery. Constable Rose is a giant in comparison and a machine when it came to moving dirt. He could move 10 times the volume of mud in the same time as any of us. His sense of humour was extraordinary and he kept the morale up for us all. It had been commented by a bystander, who did nothing to help except criticise, that we were all quite urban in our approach – which became the standing joke for the duration of the recovery. The hours dragged on, progress was slow, we were buggered, but with humour and teamwork both vehicles were finally on firm ground. Morale never wavered due to the professionalism, teamwork and drive of the police officers involved. There were cheers and shouts of joy which I am sure could be heard miles away. 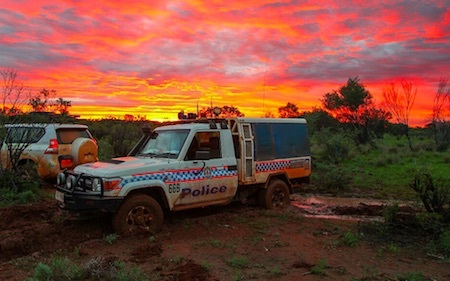 Sgt Jolley and Constable Rose are both a credit to the Northern Territory Police Service and an asset at the remote Yuendumu Police Station. We are very thankful for their assistance – had it not been for them we would probably still be there. What was more memorable – the bog or the sunset? Officers Jolly and Rose are true blue metaphorical soul mates of the constabulary in Melbourne CBD. 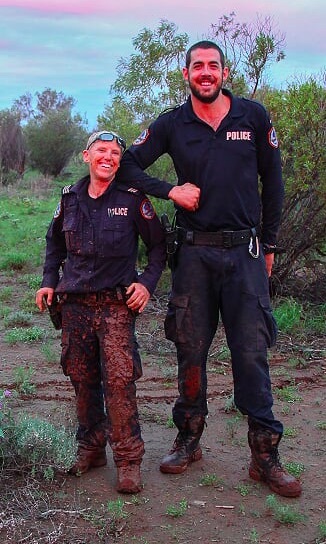 While these Yuendumu cops were battling waist deep in Tanami bulldust turned to mud by rain, their Melbourne counterparts have been up to their armpits trying to perform their duty-turned-to-mud by the bulldust of political correctness imposed upon them by the hierarchy. At least officers Rose and Jolley were able to use shovels to move the crap. The boys and girls in blue down in the Big Smoke are trying to do do it with their hands tied. True COP: Courageous, Obliging, Persistent. Courage is the first of the human virtues, because it makes the others possible. Aristotle. Nothing like a good bog event to test and build character … and to make drivers more wary in future. Well done the coppers.